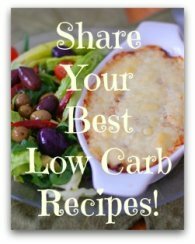 Select the types of cheese best suited for your low carb needs. There are so many types of cheese and each one offers a unique gastronomical experience.And most cheeses for each ounce contain about 1 gram of carbohydrates. Some a little less and some a little more. I’d like to share some information, which I think you’ll find useful the next time you serve cheese to your guests or you're in the mood for a snack. In more recent times, cheese is being served at the end of a meal either before or instead of a traditional sweet dessert. This is great news when you're following a low carb lifestyle! 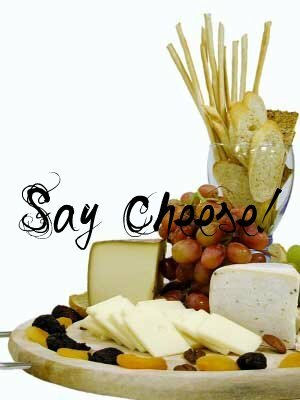 Did you know that most types of cheese contain enzymes and bacteria (the good kind) that actually help with digestion? Which makes it another great reason to also consider using cheese for dessert. OK, let's go over some simple guidelines when you're serving cheese. When it comes to entertaining, the cheese tray is a must. But don't overwhelm your guests with too many choices. Select no more than three or four cheeses. And remember, take cheese out of the refrigerator at least 2 hours before serving. Cheese needs to be at room temperature to experience its full flavor. Cold cheese is nearly tasteless. A few cheeses at the right temperature and that's it! It couldn't get any easier than this. In a low carb kitchen there is no traditional bread or crackers. But if you're entertaining you may want to add some crusty Italian bread and a dark pumpernickel. But if you think you'll be tempted, avoid the bread. As for crackers, the blander the better so as not to take away from the flavors of the different types of cheese. I don't eat them myself but I like to serve English water biscuits and Scottish oat cakes to visitors. You should serve butter, on the side, at room temperature. Even though a cheese connoisseur won't use butter, the typical person will. Fruit goes great with cheese. Choose berries or cantaloupe wedges which are lower in carbs than the traditional bowl of grapes or dried fruit. Do You Serve Cheese With Utensils? Use a serrated knife. A soft cheese will just squish down and get messy if you use a butter knife. It just won't slice through the cheese properly. Although most cheeses are spread or placed on bread and crackers with knives, small forks are also appropriate. This is handy too because some diners, like me, prefer cheese on its own. Using fingers to pick up crumbly Parmigiano-Reggiano is an acceptable nibbling option too! 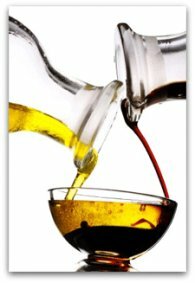 Try it drizzled with olive oil and balsamic vinegar! Unless you want to dedicate a great deal of time perfecting this skill, I suggest you just keep things simple. Most of my guests have a wine they prefer and they tend to stay with it no matter what I'm serving. So don't stress too much. Red wine is great with most types of cheese. White wine will really enhance fresh goat cheese. 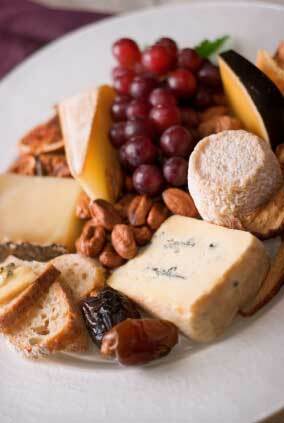 Sweet wines are terrific with blue cheeses and other strong cheeses. Try a Sauterne with Roquefort. And Port is perfect for a strong cheese after dinner. When you're following a low carb lifestyle, go for the dryer wine and skip the sweet wines altogether. Listed below are 50 of the most popular types of cheese. 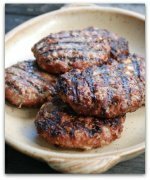 We're busy compiling information and great recipes for each one, so check back often as we are updating this site on a regular basis. Those underlined are links to specific pages which also feature recipes for that particular cheese. Return HOME from Types of Cheese.